I first read this book when I was a wee lad, probably about 10 or 11 years old. 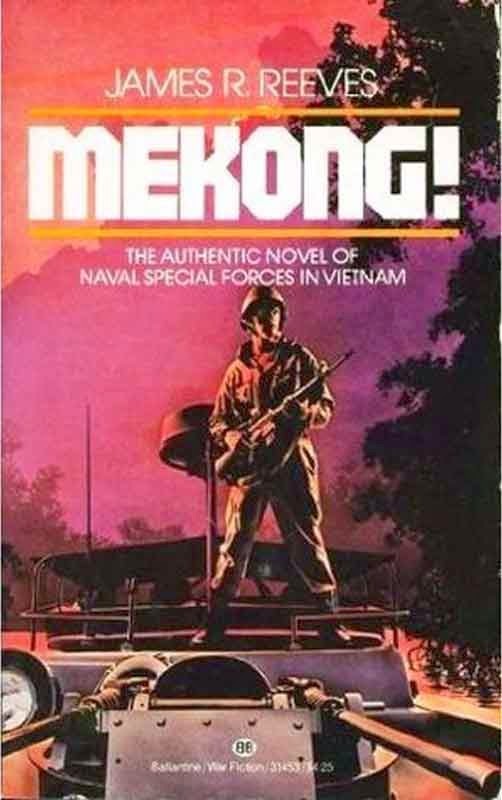 I may have read it again some time in either junior high or high school, but either way, it'd probably been 25+ years since I'd read MEKONG! last. I had a few memories of the book, and remember it was violent and cool (for a kid obsessed with war fiction) and very dark and disturbing at the same time. In recent months, I'd discussed with several people the idea of writing a story set in Vietnam. While Jamie Lynch (of KILLER INSTINCTS and HANGMAN) is a Vietnam vet, I wasn't sure if I was ready to tackle the war in anything but anecdotes and flashbacks, but it'd been a long time since I'd read any Vietnam war stories. A few years ago I read MATTERHORN, an excellent Vietnam novel, but it is a huge tale, and much more literary than I was expecting at the time. I wanted to get back to the older, slightly pulpier 'Nam stories of my youth. So, I bought MEKONG! used via Amazon. It is interesting to see the reviews - four of them, evenly split between 5-star and 1-star. Those who gave five stars found it an engaging and well-written story, while those who give it one star condemn the book on the grounds of Stolen Valor. The author, James R. Reeves, claimed he wrote the book after interviewing the protagonist, a former Navy SEAL who'd served in Vietnam. Apparently, James C. Taylor never served in 'Nam, nor was he a SEAL - he was a Navy mechanic, stationed stateside. Now, I have no idea what actually took place to bring this book together and get it published. It is apparently the author's first novel, and it was put out by Ballantine books, a major publisher. I'm skeptical of the notion that Reeves was able to go through the whole publishing process without anyone questioning if Taylor was the real deal, so either Reeves lied to Ballantine, Taylor fooled Reeves, or Ballantine worked with Reeves (and possibly Taylor) to pump up the "true life" aspect of the book. Any of the above could have happened in one fashion or another, and I doubt anyone involved cares one way or another at this point. While I am disappointed that this isn't an actual novelization of someone's SEAL tour in Vietnam, as far as a war novel goes, it is pretty damn good. The characters of Tyler and Brewster, Chief and Poppa and Lieutenant Commander Grey all come to life and resonate well during the reading. There's a lot of action and reflection, a lot of anger and yet, some great laughs along the way. The story of the bar and the attack dog is great, as are a few of the other light moments. The story really does a solid job of depicting "guys in war", with all the good and bad that comes with that. There's a lot of violence, too. There are multiple chapters with combat in them, from killing sentries to full-blown battles and firefights, to riverboat attacks and ambushes. There's a pretty graphic description of a sentry being garroted by a length of piano wire that'd stuck with me since the first time I'd read the book. There's also an ad-hoc post-mortem of a dead VC where the damage done by various weapons is broken down (the characters are rather distainful of the M-16's 5.56mm round, and Tyler acquires an M-14, which he carries for the rest of his tour). There are a few other scenes of graphic violence involving booby traps that are highly disturbing, as they should be, of course. Overall, this is a pretty solid, entertaining war novel, especially as someone's rookie effort. Setting the problem of Stolen Valor aside, it does a good job of reading as a memoir as well as a novel, and I think probably comes pretty close to hitting the mark as to the attitudes and actions of Riverine sailors and SEALS in the ~1970 time frame, as the war turned more and more to "Vietnamization" of the war effort, training and handing duties over to the ARVNs. Paperbacks can be had for a song on Amazon, so if you've got an interest in the subject matter, check it out.